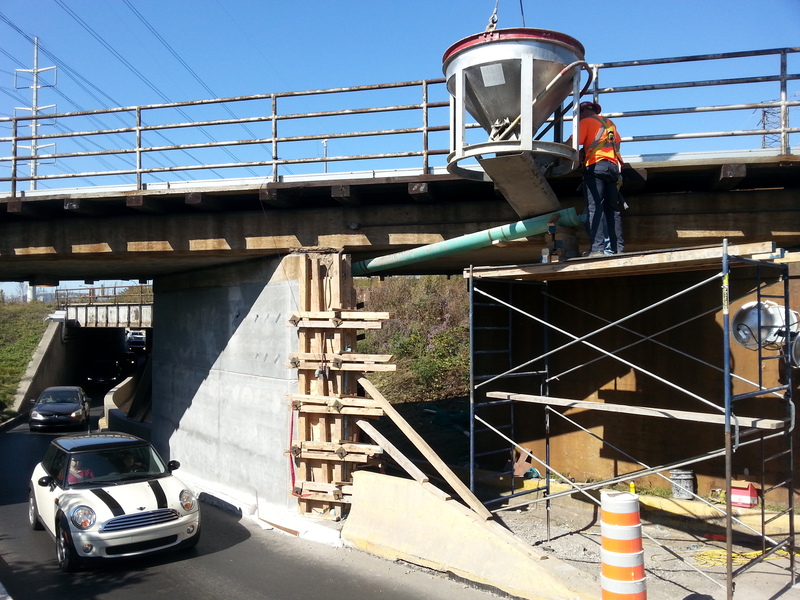 The Canadian National Railway (CN) and their consultant for this project, AECOM, were looking for an innovative and durable solution for the repair of an existing rail bridge pier in Montreal. 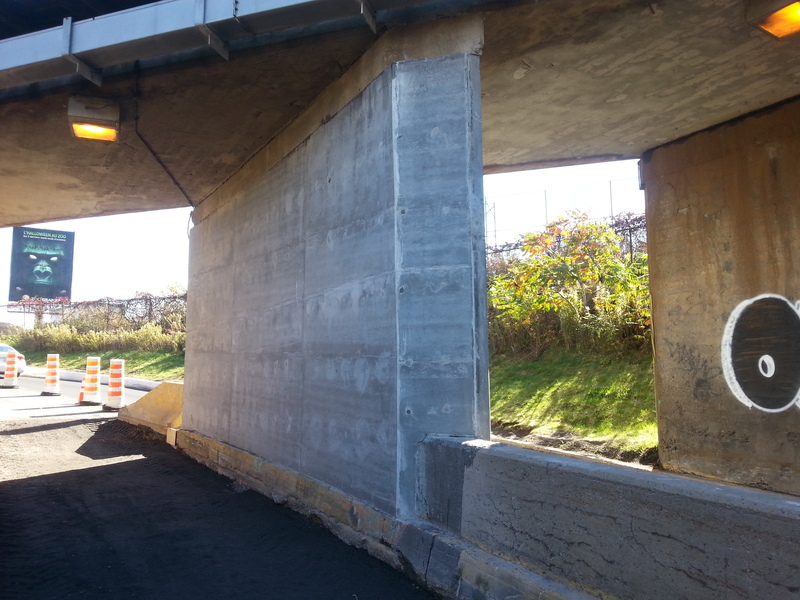 The railway bridge crosses over an access ramp to the Victoria Bridge and the lanes are quite narrow; hence the concrete repair cover had to be as thin as possible in order to maintain adequate clearances. In this case, the existing column is able to sustain the gravity and train loads, while the repair to the column is required to provide protection against chloride and freeze/thaw. The main reason that UHPC was used on this repair project was because it had to last at least twice as long as a traditional repair method. Deterioration of the existing pier was accentuated by the topography of the area. The bridge ramp has a long gradual slope, continuing past the bridge. The catch basins are located further on the east side of the structure, hence rain water and deicing salts (in the winter) continually flows in this area and is spread by vehicles on the pier. Consequently, due to its superior durability properties, UHPC was an excellent candidate for this repair project. The contractor, DJL Construction, had to work under challenging conditions. One lane of traffic had to remain open during the construction and train traffic would have to continue without interruption on the bridge structure. 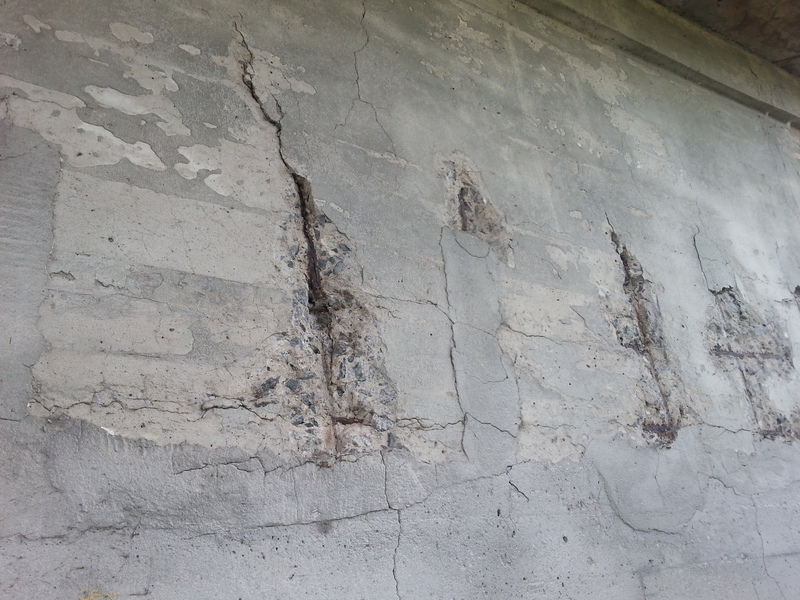 The existing concrete condition showed considerable degradation. The contractor commenced demolition on the west side of the structure until sound concrete was reached. Galvanized rebar was then added and the forms set to allow for approximately 100 mm thick of new concrete. UHPC is a flowable, self levelling material and for that reason, hydrostatic pressure must be considered. It is very important that the forms are watertight. In this specific case, when a train was travelling across the structure, noticeable vibrations were experienced. The original plan was to cast the whole west side in one continuous pour. The UHPC was batched on site using a pair of high shear mixers to batch bulk bags of material with an output of 0.5 m3 per load. Each load was then taken from the staging area to the site with a large forklift and hopper. When the form was filled three quarters of the way up, a leak developed at the bottom of the form. Once the leak was controlled, the project team decided to stop and continue the pour a couple of days later. As mentioned earlier, the train activity was sporadic but still present and the structural vibrations (when trains passed by) likely contributed to the leakage. Since the cold joint was located at an elevation above the splash zone and the UHPC has the ability to fill complexe shapes and textures, it was not required to do any special surface preparation prior to the match pour. 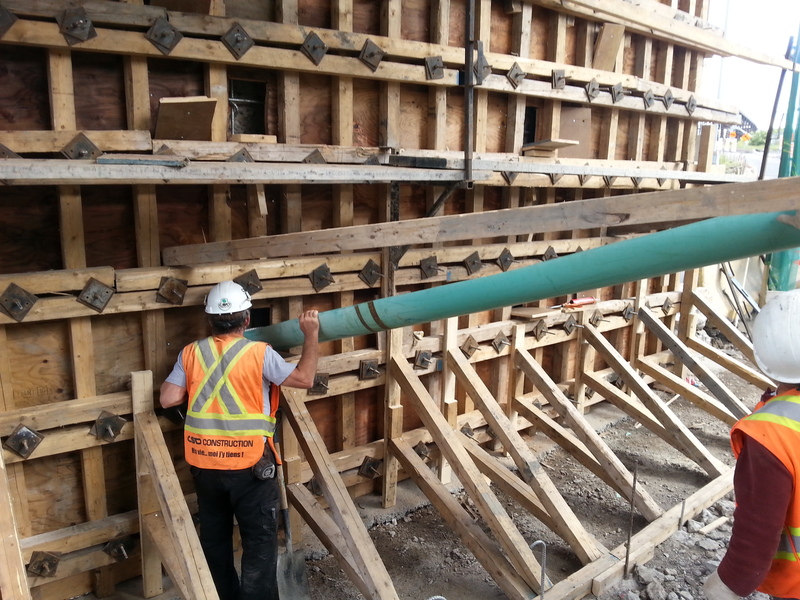 A UHPC slurry mix was used to fill the attachment points once the forms were removed. Because of the lessons learned on the west side, it was then decided to complete the work on the east side in two separate pours. The project was completed in mid-October 2013. This cast-in-place application showed that proper forming techniques are required when UHPC is used for large pours. The forms must be designed to be able to contain the material in its fluid state. This requires more attention compared to a pour using conventional concrete. Batching small quantities of material on site was also beneficial, as waste could be minimized, since batching could be stopped if problems or delays occurred on site. 4.5 in. thick Ductal® jacket cast around an existing pier (1’-10 in. wide x 11 ft. in height). 4 mobilizations, 2 lifts per side. Deteriorated surface due to rebar corrosion and chloride spray because of the very narrow lanes. Owner wanted to minimize maintenance and required a material with very low porosity and that could last at least twice as long compared to normal concrete.